A car accident shut down four lanes of traffic on Interstate 5 near Mercer Street in Seattle during the morning commuting hours. The crash involved at least one rolled over vehicle, and the lane closures caused a five-mile backup for drivers leaving Federal Way. Drive times into Seattle skyrocketed to nearly 60 minutes. The Washington State Department of Transportation also reported traffic delays on the West Seattle Bridge. The scene was cleared at approximately 8:39 a.m. Police have not yet released details on the circumstances of the crash or the number of cars involved. 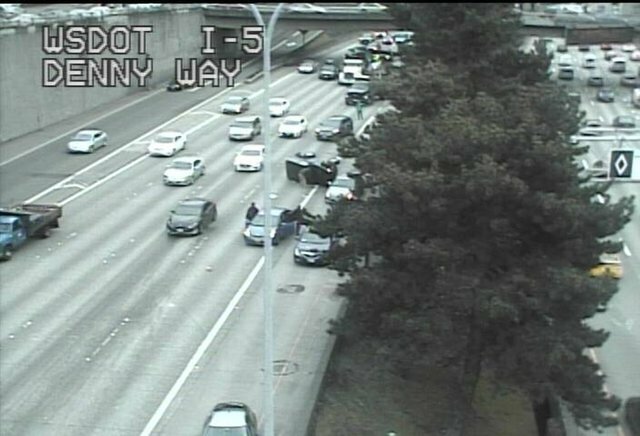 Images from traffic cameras near the scene show on dark-colored vehicle that had rolled over blocking the left-hand lane. Another car appears to be stopped partially in the left-hand lane, and someone is standing outside observing the scene; a sports-utility vehicle behind the rolled-over vehicle is also stopped, with someone standing outside of it. It is unclear from available images whether these vehicles were also involved in the crash, or whether these are police vehicles or good Samaritans at the scene. Just last week, a tanker truck that rolled over on I-5 brought traffic in Seattle to a standstill for hours. Seattle’s unique geography forces traffic to pass through just a few choke points as it flows around the city. One bad accident, or even a fender-bender, at the wrong place and the wrong time can disrupt traffic for tens of thousands of people. Traffic backups after an accident can make it hard to clear the scene. While emergency responders such as police officers and medics can turn on their emergency lights and circumvent some traffic laws, not all vehicles needed as part of a emergency response can get around stalled traffic. Tow trucks aren’t allowed to disobey traffic laws; they often end up waiting in the same traffic backup as everyone else. In extreme cases, WSDOT can switch the flow of express lanes or reserve those lanes for emergency vehicles. This is a large-scale operation that can’t be done immediately, so transit authorities must carefully consider whether shutting down the express lanes for hours will help overall traffic flow. Fewer cars on the road might help—but many commuters have no choice but to drive, or to take surface-level buses that can also be caught up in traffic. Seattle is still working on building a grade-separated light rail line, and tunneling is expected to last for years to come. While voters approved an ambitious plan to improve light rail access in Seattle, state lawmakers are pushing back, complaining that the bill won’t benefit their constituents outside Seattle despite taxing them under a complicated, and possibly outdated, car tab system.